Pioneer revealed its Toraiz SP-16 hardware sampler earlier this week, along with the news that analog filters from Dave Smith were baked in. But beyond that, online specs were a bit vague. So we’ve just gotten to meet up with Pioneer (and Dave) and get close to a prototype unit. Firmware isn’t done yet, but we got to learn a lot more – and there’s a lot to like. Please note – this is early firmware (see the cheeky shot of the firmware about page I took). Some appearance and functionality may change. Actually, I already quite like the way it looks, so it does seem well on its way. Yes, it samples live. There are stereo input jacks on the back. 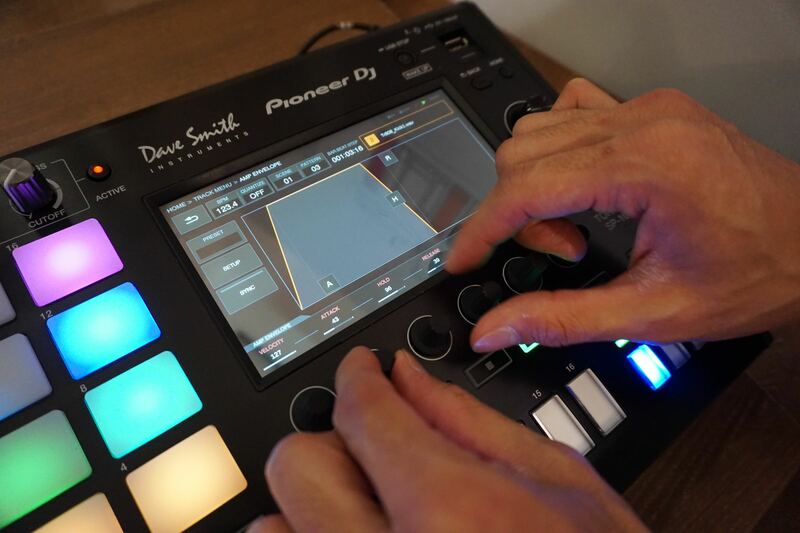 From there, you can sample live as you play, including the ability to slice samples on the fly and assign them to pads. 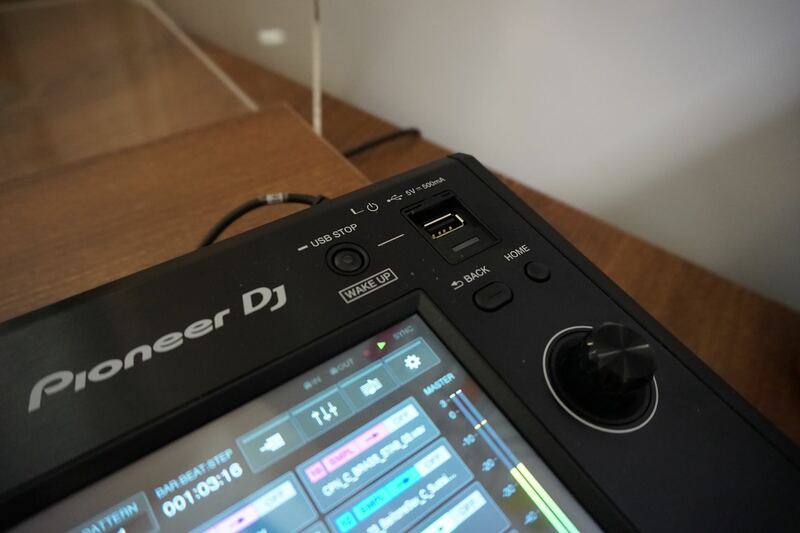 Unfortunately, those screens weren’t ready to show yet on this firmware, but Pioneer confirmed this is designed for live performance. I think that’s huge, given that part of the pitch is connecting this in a booth and doing hybrid DJ sets. Audio I/O means you can re-sample after the filters. There’s 8 out jacks, including the 2 stereo outs, as I noted in our first preview. Run cables back into the inputs, and you can re-sample sounds after the filter – very nice. Load samples via USB stick or USB connection to the computer, as well as live sample. There are other ways to get samples on the device. True to form for a Pioneer device, there’s a slot for a USB stick. And if you connect to a computer, the SP-16 shows up as a Mass Storage Device. We didn’t get to test that, but I did try browsing through samples, which you can do from the rotary encoder. Our first look at sample editing. You can adjust the envelope here via the encoders, or via the touchscreen. Touch, twist, or press. If you want to use the touchscreen, you can – it makes navigating screens and selecting samples easy, and you can even use it to do things like graphically adjust envelopes. Latency was a bit noticeable on the prototype firmware, but Pioneer says later firmware will address that. What’s nice about the layout of the SP-16 is there’s basically never a case where you have to use the touchscreen for something critical. Most everything is also mapped to the pads, encoders under the display, rotary, and so on. So it appears you’ll never have to worry about sweaty fingers in a live gig. The touch strip looks useful – and gives you your repeat/roll. 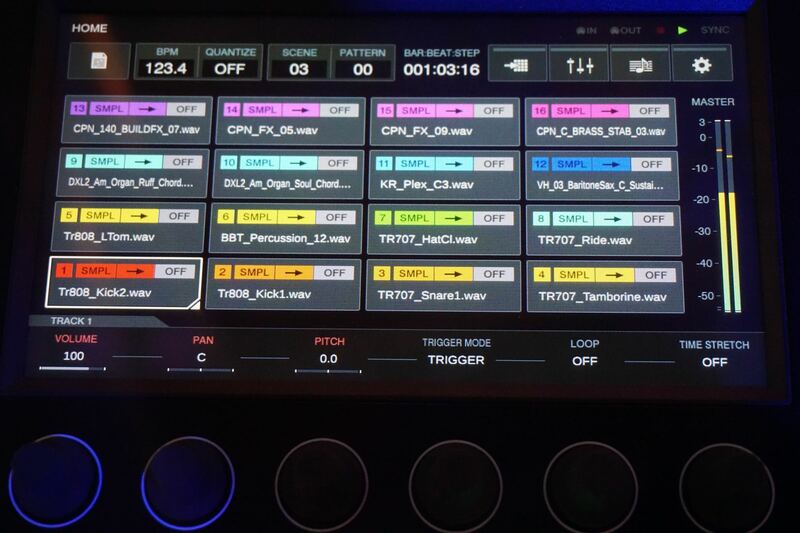 The touch strip, something we’ve seen on devices from Native Instruments and Ableton recently, performs several functions. It’s also your roll/repeat. Hardware feels and looks pretty solid. Up close, this feels like a Pioneer DJ unit. 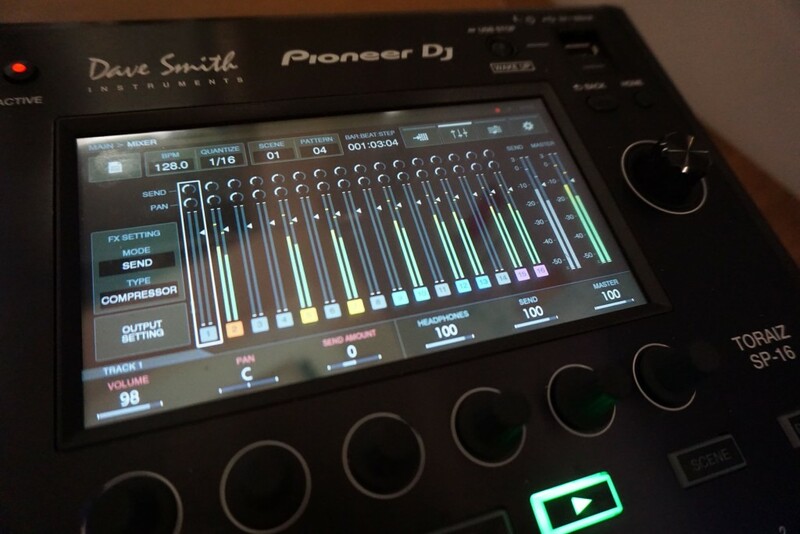 It’s much more attractive in person than in product photos (probably also true of my product photos), and fit and finish is all similar to other Pioneer gear – if you’ve used a recent Pioneer DJ mixer, in particular, you know what the knob caps and so on feel like. But the touch strip was responsive, and the surface on the touchscreen felt good. I found the x0x buttons a bit spongey and wasn’t blown away by the potentiometers, especially given this unit as a premium price, but I found no deal-breakers so far. The main thing is, I didn’t get to test the thing I most wanted, which was the pad sensitivity. You get basic pattern and sequencer options. The four buttons at bottom right let you chain up to four 16-step sequences together, or trigger them individually. Hit “PATTERN,” and the sixteen x0x buttons on the bottom let you trigger patterns. There’s also a song/playlist mode coming, though we couldn’t yet see that screen. MIDI output is coming. Cough, Elektron, cough. 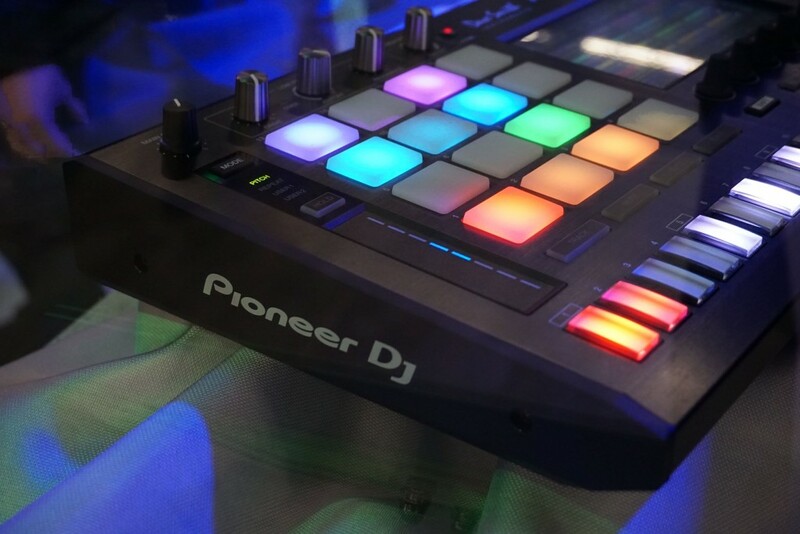 Pioneer says they plan to support MIDI output from the sequencer to external hardware in future firmware. (It’s unclear whether that will be ready when it ships.) 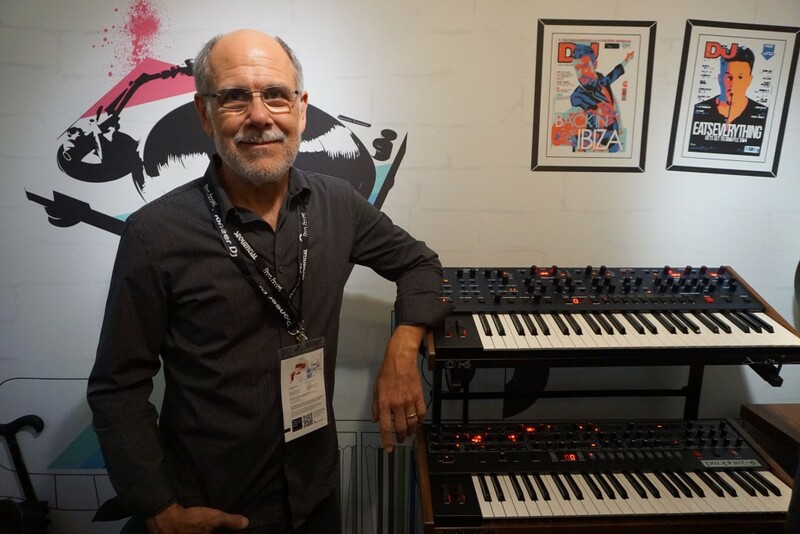 That of course makes sense in a booth where Pioneer were standing next to Dave Smith (literally, Dave himself, not just the brand), father of MIDI, and a rack of a couple of Prophets. We also hear a VST plug-in for DAW integration could be in the works. Dave Smith Instruments like the sound. Well, no surprise there: it’s their filters! But I do know the DSI crew want us to hear it, even if Pioneer don’t. A closer look at the pad overview. The (prototype) tempo screen – note, shuffle. It’s always great to get to talk to Dave – if surprising to see him in a Pioneer DJ booth! Those filters are on the master. I didn’t mention this, as I thought it was obvious: yes, for both low-pass and high-pass, signal is routed through filter pairs at the master out, not individually for parts. All of those outputs could be useful for effects. And right now, it looked like the SP-16 might be a bit deficient in the effects department (relative to something in software like Maschine). MPC meets x0x. 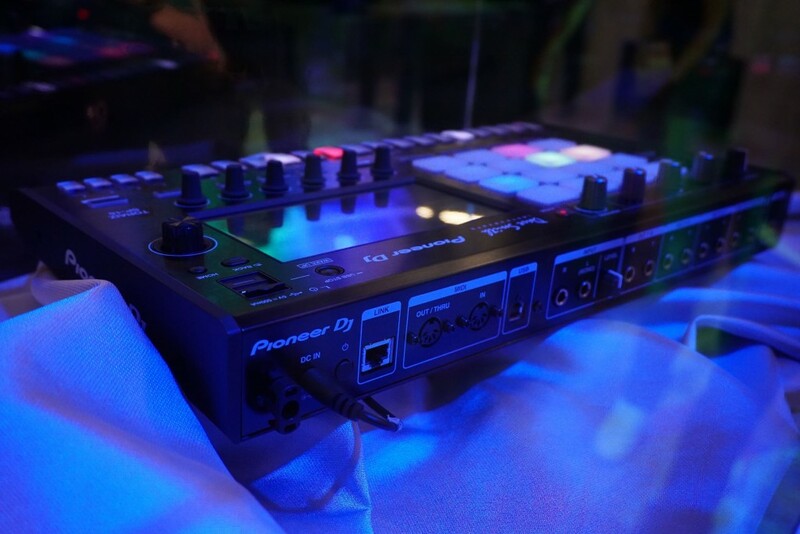 Yep, those x0x buttons on the bottom are very reminiscent of the ones on Roland’s AIRA TR-8. 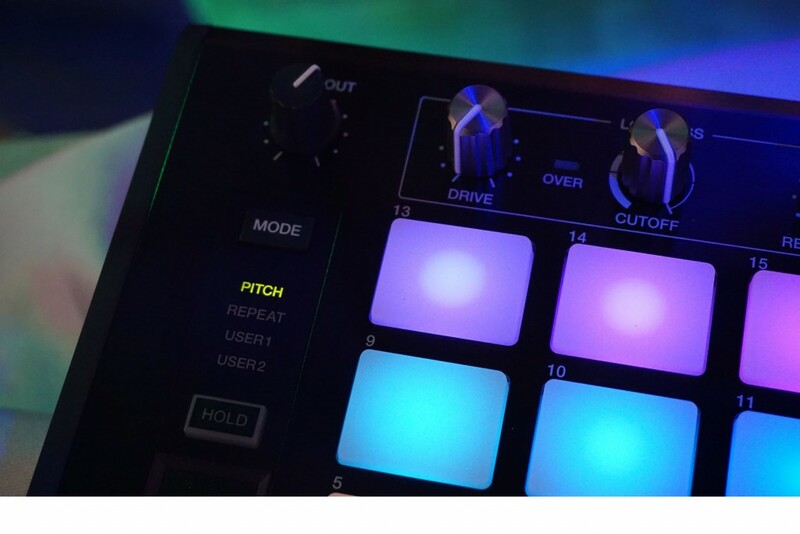 The feel is a little different (Roland’s are click-ier somehow), and of course the main thing is, here they’re paired with an MPC-style 4×4 pad layout, too. I think it’s worth commenting on the filters, in particular. Remember, the whole selling point is that you’re getting analog filters. And you have ready access to both low pass (with resonance) and high pass right on the top of the unit. Now, let’s say what you really want is more flexibility over each voice. 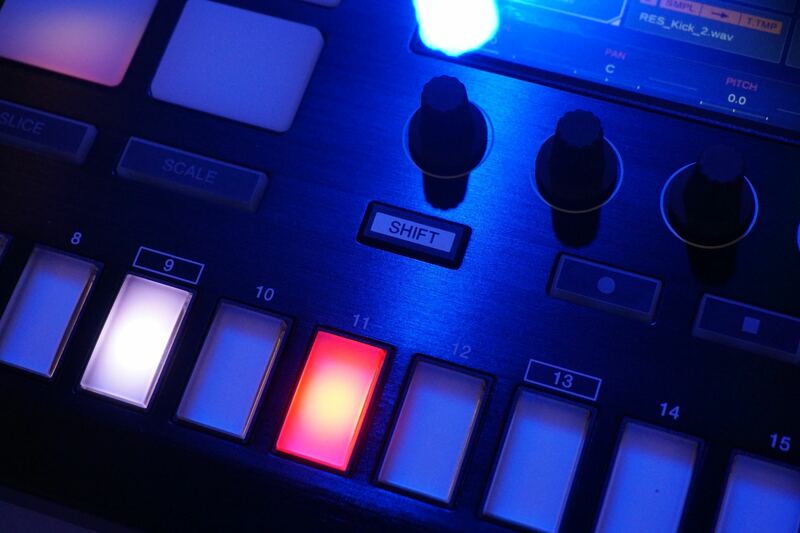 Software like Maschine will happily do that for you. 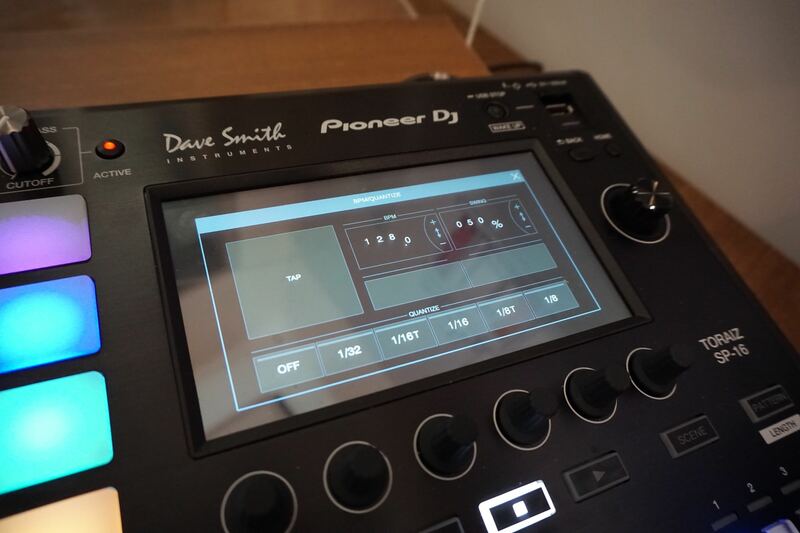 And if you’re describing a drum machine with 16 pads and a per-voice architecture more like a synthesizer – with Dave Smith filters on each voice – well, you’re really describing the Dave Smith Tempest. But this isn’t a Pioneer Tempest. I think it makes loads of sense to have filters on a master bus when you’re playing live – not only for the DJ market, but for accessibility in general. 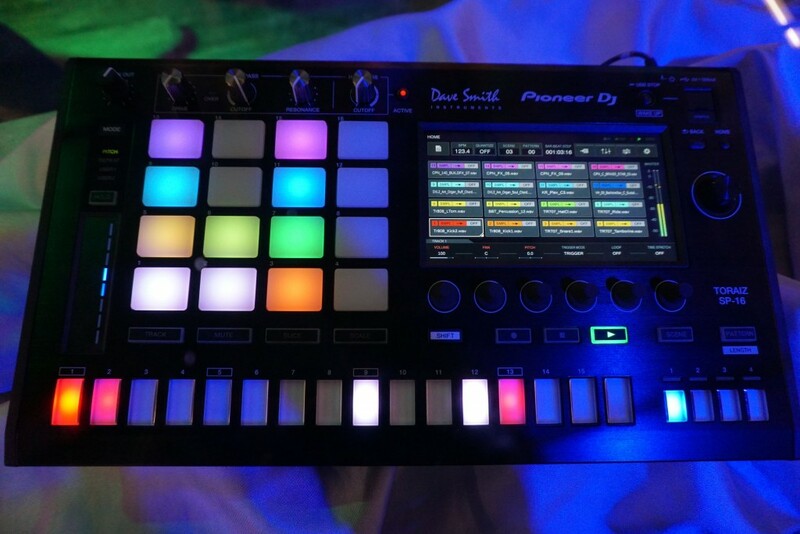 Also, remember, what the SP-16 is that the Tempest isn’t is … a sampler. So anything you want done to a particular drum part can be done to the sample. I like the Tempest. I like the SP-16 (so far, at least). I also like chocolate and oranges. But I don’t complain that chocolate doesn’t make good juice or that oranges aren’t able to melt over my ice cream. If they get this right, I expect this could be the first sampler some DJs buy – and the first Pioneer hardware some producers buy. 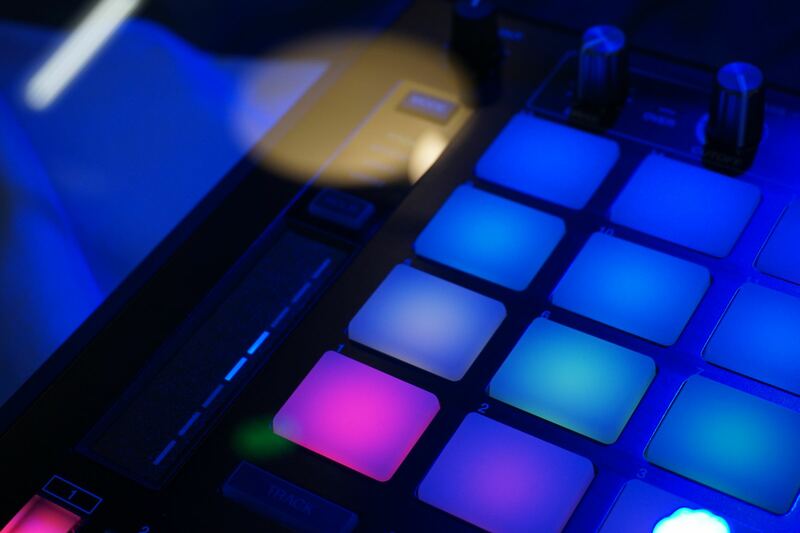 It’ll be great to put it up against its rivals from Akai, Native Instruments, Elektron, and others.